Note: This blog was originally published on the site of the University of Leicester. Ahead of our Waugh’s Enemies event on Monday 25 September, Milena Borden gives a brief history of Waugh’s hostile relationship with Hugh Trevor-Roper – and asks what it tells us about Oxford’s post-war battle of ideas. There is no shortage of writing on the feud between Evelyn Waugh and Hugh Trevor-Roper. Most of it has tended to focus on Waugh’s hostile letters to Trevor-Roper and their incompatible characters. But what about looking into the story as a guide to the battle of academic ideas in Oxford after the end of the Second World War? 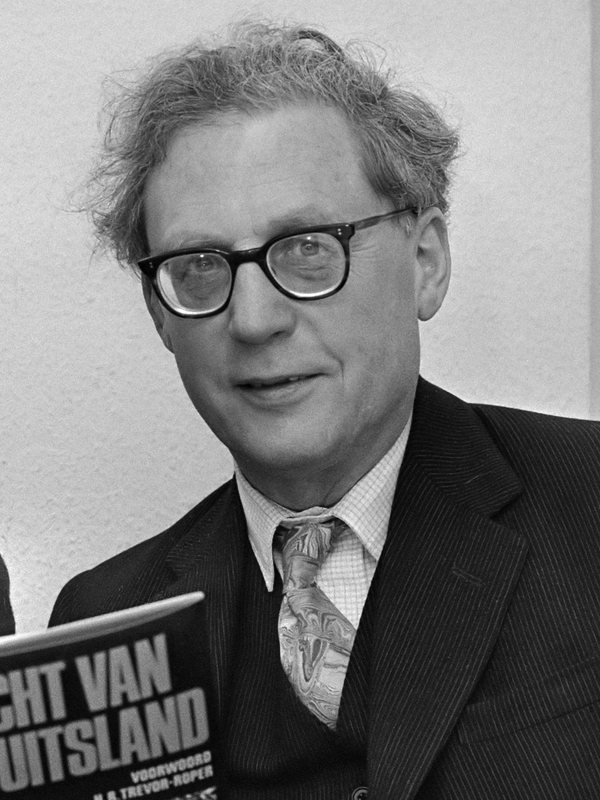 The son of a country doctor, Trevor-Roper read for two degrees, Classics and History, at Christ Church (1932 – 1937), became a Research Fellow of Merton College in 1938 and from 1957 until 1980 was Regius Professor of Modern History at Christ Church. During the Second World War he was a code-breaker and also became an expert on Germany. One year before his retirement, he accepted to be Master of Peter House at Cambridge. In 1980 Trevor-Roper concluded his valedictory lecture with the words of Evelyn Waugh during one of their public spats twenty-six years previously: ‘One honourable course is open to Mr Trevor-Roper. He should change his name and seek a livelihood at Cambridge.’ He expressed regret that Waugh was no longer alive to enjoy his victory. Trevor-Roper was an admirer of Waugh as a prose writer, but was afraid to meet him in person because of their intense intellectual animosity. 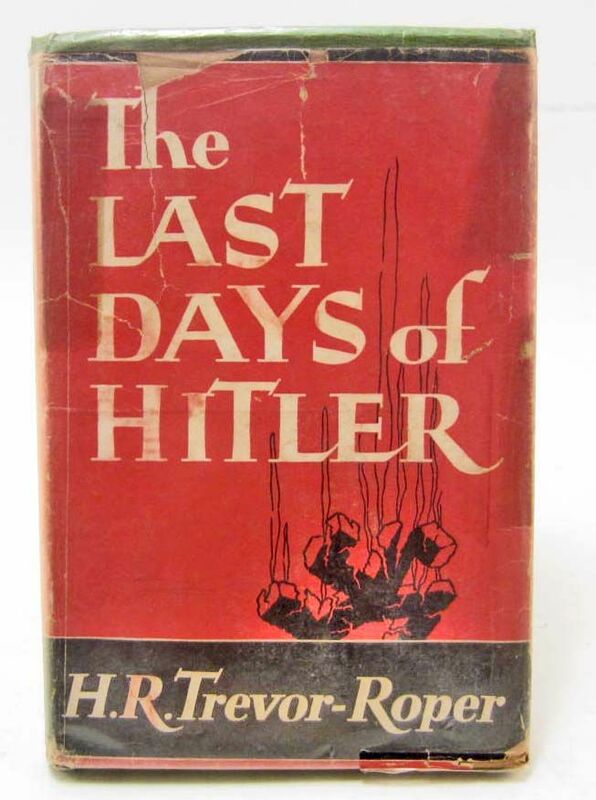 Trevor-Roper’s first book The Last Days of Hitler (1947) became famous. It was enthusiastically reviewed and praised by established Oxford historians including Alan Bullock, Lewis Namier and Lawrence Stone. But one aspect of his book provoked angry reactions in Catholic circles. It claimed that Goebbels, the Minister of Propaganda in Nazi Germany, learned how to manipulate knowledge during his Jesuit education. Trevor-Roper also wrote that Himmler was like Cardinal Robert Bellarmine, known for his role in the Giordano Bruno and Galileo Galilei affairs, because they both were kind to animals. Trevor-Roper’s The Last Days of Hitler (1947) erroneously claimed Goebbels was educated by Jesuits. So, what does this quarrel tell us about Waugh, Oxford, and the bigger question – ‘What is history?’. Is it factual, unemotional and secular or is it inductive and tainted with beliefs, and religious faith? Waugh, a devout Catholic, argued against the idea that fascism could be linked to his religion, whereas Trevor-Roper – a staunch anti-Catholic – understood and accepted criticism only if it was on the ground of academic accuracy. Waugh extended his absolute disdain for the historical empiricism of C. R. M. F. Cruttwell, his history tutor at Oxford, to The Last Days of Hitler, the book, which A. J. P. Taylor called ‘a delight for historian and layman alike’. The quarrel reached a point where all could enjoy the infinite view of history debates at Oxford. At the time of posting there are still a few places available for Waugh’s Enemies. Visit our eventbritepage now to join Alexander Waugh, Ann Pasternak Slater and Barbara Cooke in picking over Waugh’s hit-list. Adam Sisman, Hugh Trevor-Roper: The Biography, 2010. Martin Stannard, Evelyn Waugh: No Abiding City 1939 – 1966, Volume II, 1993. The Tablet, 28 June, 1947. 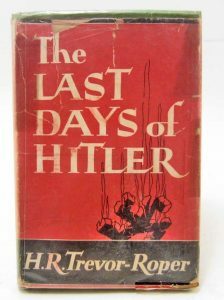 H. R. Trevor-Roper, The Last Days of Hitler, 1947; Second Edition, 1950. Nowadays Kelmscott Manor is a Grade I listed building owned by the Society of Antiquaries of London which attracts many visitors. The two floors and the attics are nicely restored with original Morris fabrics on display. At Kelmscott, Rossetti occupied the Tapestry Room, turned into a studio, and complained that it was claustrophobic. Waugh noted that the tapestries which ‘worried Rossetti’ were in the house before the Morris family moved in and have a heavy feel. Today there is an easel on display, which presumably was used by Rossetti or other of the Kelmscott artists, a stylish oak table designed by Philip Webb and a Chaucer book with woodcut illustrations by Morris. Rossetti’s presence is also marked by the two crayon portraits of the Morris’s young daughters, mentioned by Waugh in his diary entry, and his oil painting “Mrs. Morris” also known as the “The Blue Silk Dress” (1866-70). He referred to her in the book as being ‘in the full maturity of her profound and lustrous beauty’. Waugh met May Morris (daughter of William Morris’s wife Jane) and described her in his diary as ‘a singularly forbidding woman – very awkward and disagreeable dressed in a slipshod ramshackle way in hand-woven stuffs’. Waugh was twenty four years old when he gave his verdict about Rossetti’s art and the Pre-Raphaelites, underlining that he was stating the problem of subjective aesthetics ‘fatally lacking essential rectitude that underlines the serenity of all really great art.’ This seems still to be a point made by critics of the Pre-Raphaelites. But equally there is an agreement that Rossetti’s mystically romantic style was followed by many artists in the various forms of the Arts and Crafts movement and laid a stone in the foundations of European Symbolism and Art Nouveau. Perhaps Waugh’s biography should be read by everyone interested in connecting Rossetti (the artist) to Waugh (the biographer), with Kelmscott Manor being a nice place to do this. A strikingly beautiful house appears a short distance after driving through Madresfield village and turning towards Madresfield Court. It is sitting at the foot of the Malvern Hills and is approached across a bridge over a moat. I arrived at noon on a balmy autumn day to see the real house of the Lygon family and get closer to their sensibilities, which inspired Waugh’s masterpiece novel Brideshead Revisited. Inside this grand but very homely English country house, Tudor, Victorian Gothic and Arts and Crafts styles are all interwoven with a charming accumulation of Parisian, Dutch and Danish furniture, massive family and rare royal portraits, fake Holbeins, William Morrison fabrics, unusual artefacts and sculptures, marble fireplaces, valuable armoury, early-oak carved chests and antique travel trunks. Waugh’s desk and chair have been moved from the upstairs nursery, where he stayed during his many visits to Madresfiled (1931-1938), to the bay in the Long Gallery overlooking the Moat Garden. They seem to be the only uncomplicated items displayed on the otherwise highly ornamented first floor. Hugh Lygon, Waugh’s Oxford friend famously depicted as Sebastian Flyte, stares melancholically from a small modestly framed photograph tucked away in a corner of the dramatic top-lit, double-height staircase hall designed by his father, the seventh Earl Beauchamp who is the prototype of Lord Marchmain in Brideshead. Portraits of his sisters who adored Waugh and also found a place in the novel are spread across the wood panelled walls of many rooms and corridors. Waugh wrote his novel Black Mischief while staying at Madresfield in 1931 and a copy of the book dedicated to Mary and Dorothy together with other first editions are said to be kept in the Smoking Room but in the today’s Madresfield there is no public access to it. In the Library one can see shelves going all the way up to the high ceilings holding thousands of volumes including bibles, musical scores, dictionaries and albums. The chapel seems unchanged since it was first seen by Waugh in 1931. It is decorated in the Arts and Crafts emblematic expression with idyllic pastoral scenes surrounding the portraits of the Lord and Lady Beauchamp as well as their seven children. There are beautiful murals, stained glass and candlesticks designed by Henry Payne. This is a Church of England chapel with some soft blue Italian Renaissance style colours. Although it does look a lot like the one in Brideshead, it also feels different from the strictly Catholic chapel given as a present to Lady Marchmain by her exiled husband. In Brideshead Waugh seems to have immortalised just one episode of Madresfield’s almost one thousand years old life. But it is deeply convincing especially as shaped by his affectionately fictionalised romantic love for the Brideshead set. My two hours inside Madresfield was like stepping into an extraordinary still-life painting to meet its amazing inhabitants and to eat, drink, sleep, read, write and laugh with them. James Macdonald’s new play staged at the Upstairs of the The Gatehouse is inspired by the Evelyn Waugh and Randolph Churchill’s Second Wolrd War mission to Yugoslavia in the autumn of 1944. The venue is the charming 16th century Highgate village pub just under two and a half miles away from Waugh’s family home on 145 North End Road. The scene is the farmhouse in Topusko where their stormy friendship escalates to a comical antagonism fueled by the angry local cook, Zora Panic. The script followes closely the well documented wartime espisode with the name of Fitzroy Maclean who was the head of the mission dropped more then once during the two acts. Details such as Waugh’s “camel-hair dressing gown”, the £50 Bible reading bet and the box of Havana cigars sent from London seem to have been borrowed from the Earl of Birkenhead’s memoir “Fiery Articles” in “Evelyn Waugh and His World” (1973: 137). The pattern of the play is a circle of a dialogue with the two main heroes going back to where they started unable to escape the hillarious agony of cohabitaning in Tito partisans’ controlled area of Croatia. Simon Pontin as Randolph and Martha Dancy as Zora managed to provoke laughter in the audience of around 30 people and a smile of approval from the playwright who attended the Preview night. The mantle of being Waugh falls upon the shoulders of Neil Chinneck, a young London actor, who attempts to blend wit and satire into the characher by threatening to kill Randolph and himself. He achives a decent presentation of Waugh at war although it is somewhat dry in expression and wiry in appearnce. The German bombardment effects work well together with the the décor of the bare village room and Winson Churchill’s portarit on the wall. The choice of Vera Lynn’s songs as a musical background adds to the vitality of the performance. But it is the total lack of pretence that seems to be the main merit of the play. In March this year I visited Camion Hall: Jesuits in Oxford on Brewer Street in Oxford to see the place with which Evelyn Waugh’s name is so closely associated. The Secretary, Sarah Grey, arranged an appointment for me with Professor Peter Davidson who is the Senior Research Fellow and Archivist at the Hall. Davidson explained that the accounts of Waugh at the Hall are minimal, but there are three Waugh things on permanent display. The first one is an Abyssinian religious painting of the Virgin Mary with the child Jesus, which hangs centrally in the hallway of the first floor. The body paint is preserved behind a glass displayed in natural light with a beautiful blue color dominating the imagery which also has a Coptic inscription on the top. Waugh presumably brought it from his travels in Abyssinia in the 1930s and gave it as a gift to the Hall’s Collection. The second object is a Campion’s illegally printed book, which Davidson explained, Waugh must have bought on the book market in the 1930s before donating it to the Hall. It was rebound in red leather with delicate gold and is one of the five known copies of Rationes Decem (1587). The pocket size book is displayed in a glass cabinet covered with cloth together with other memorabilia including a relic silver box believed to have belonged to Campion containing traces of his blood. Finally our small group of three reached the Chapel designed by Sir Edwin Lutyens with the Stations of the Cross on the walls leading to the Lady Chapel decorated by Charles Mahoney’s (1903-1968) mural commissioned by Waugh. The gentle seasonal representation of the Lady is full with garden flowers creating a natural English botanical landscape feel. Waugh knew Mahoney who worked over ten years on the mural and almost finished it except for one wall sketch in graphite. Davidson told me that the Chapel would have been almost the same during Waugh’s time. The mural is washed every five years with distilled water. As we were leaving the immaculate Chapel with an air of absolute order and stillness, we chatted a little bit about Waugh’s friendship with Father D’Arcy who was Master of the Hall (1933 – 1945) and a very important figure for English Catholicism. Waugh in Abyssinia: Was He Right or Wrong? Earlier in November, in Italy, the mayor and two town councillors of the town of Affile near Rome were sentenced to prison for using public money in 2012 to commission a memorial of Rodolfo Graziani, the Marshal in charge of the Italian invasion in Abyssinia in 1936 who later became a minister of defence to Benitto Mussolini’s fascist government from 1943 until the end of the Second World War. ‘He gave me twenty minutes. I have seldom enjoyed an official audience more. His French was worse than mine, but better than my Italian. Too often when talking to minor fascists one finds a fatal love of oratory. …There was no nonsense of that kind about Graziani. He was like the traditional conception of an English admiral, frank, humorous and practical. He asked where I had been, what I had been, what I wanted to see. Whenever my requests were reasonable he gave his immediate consent. If he had to refuse anything he did so directly and gave his reasons. He did not touch on general politics or the ethics of conquest. He did not ask me to interpret English public opinion…I left with the impression of one of the most amiable and sensible men I had met for a long time.’ Waugh also wrote about the meeting in his diary: Thursday 27 August 1936, ‘Very fresh and business like. No Fascist speeches about the Roman civilization and the wickedness of sanctions. (The Diaries of Evelyn Waugh, ed. Michael Davie, 1976). Graziani was sentenced to nineteen years imprisonment for war crimes in 1948 but served only two years and died in 1955. His memoir, which covers the invasion of Abyssinia, Una vita per l’Italia was published in Italy in 1998. Historians continue to argue about the extend of the damaged caused by the use of chemical gas in Abyssinia on his orders with the exact number of victims remains unconfirmed to this day with some claiming they were thousands. Evelyn Waugh wrote: ‘Gas was used but accounted for only eighteen lives.’ (Waugh in Abyssinia, 1936). Author AdminPosted on December 5, 2017 December 5, 2017 Leave a comment on Waugh in Abyssinia: Was He Right or Wrong? The Royal Academy of Arts in London is holding an exhibition ‘Works of Feeling: Pre-Raphaelite Book Illustration’ in its Library Print Room (free). The 42 black and white wood engraved illustrations include four by Gabriel Dante Rossetti (1828-1882). His life and art was the subject of Waugh’s first book, Rossetti: His Life and Works, (1928). I had this connection on my mind when I went to the RA. The works are displayed with taste on the walls of the small entry to the library on the second floor and also in four glassed cases. After exploring the exquisite engravings of Millais, Burne-Jones, Rossetti, Solomon, Hunt, Sandys, Whistler and Poynter, I decided to inquire about Waugh and Rossetti and asked if there was a copy of his book in the library. But there was no card with his name in the hand- written Rossetti catalogue of that period. Waugh wrote extensively about Rossetti’s illustrations in part ‘III. The Aesthetes’of his biography. Interestingly enough, a story he wrote then about how difficult it was for the Daziel Brothers workshop to manage Rossetti’s illustrations in Poems of Alfred Tennyson, (1857) is covered in the Introduction to the current exhibition by Amanda-Jane Doran, a contemporary art writer. It did feel that the new edition of Waugh’s biography of Rossetti in The Complete Works of Evelyn Waugh, Volume 16 (September 2017) would fill a gap in the RA collection.